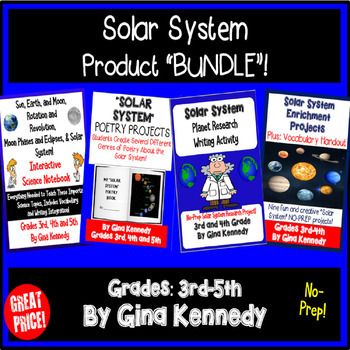 Everything you need to effectively teach the Solar System in your classroom! I have bundled four of my top selling Solar System products. Resources include a complete interactive notebook full of lessons and facts,writing opportunities and reviews; a fun Solar System research project, a Solar System menu of nine enrichment projects; and a Solar System poetry activity. Print and go activities that students love! All projects are sold individually. Please click on each individual link below to find out more about each product.